In June last year, I wrote about Mumbai artist Priyesh Tridevi taking the internet by storm with his hugely popular new webcomic, Adarsh Balak ('ideal boy'). Tridevi's comic uses the style and iconography of 80's good manners or behaviour posters, in which a young boy is depicted carrying out various tasks that make him good and polite and sensible, and subverts those concepts by showing him painting graffiti, getting his swag on, getting into scrapes, smoking pot, avoiding schoolwork by giving drugs to his parents or schoolteachers. The comic has continued to go from strength to strength, and Tridevi has incorporated his 'unideal boy' into everything from murals to band posters. No doubt much of the success of Adarsh Balak is due to it being such a ubiquitous, familiar text, and a more contemporary generation who grew up with it in schools and beyond, being able to appreciate its reinterpretation. Most recently, Tridevi's been tapped to produce a poster for screenwriter and director Anurag Kashyap's latest film, Ugly, and it's a convergence of interests and aesthetics that seem to fit very snugly. Kashyap is somewhat of an indie darling within Indian cinema (and deservedly so), with films such as Black Friday, Gangs of Wasseypur, Dev D and more, garnering critical and commercial acclaim as mainstream Indian audiences in the last decade have sought out more meatier fare than the masala blockbusters for which Bollywood is considered synonymous with. Ugly is a tale of corruption, indifference, and systemic violence that begins when the 10 year old daughter of an aspiring actor disappears from the car in which he briefly left her, while on the other hand a power-hungry super cop who is increasingly dependent on a cocktail of alcohol and anti-depressants, makes his way through this whole event. You can see the trailer here. 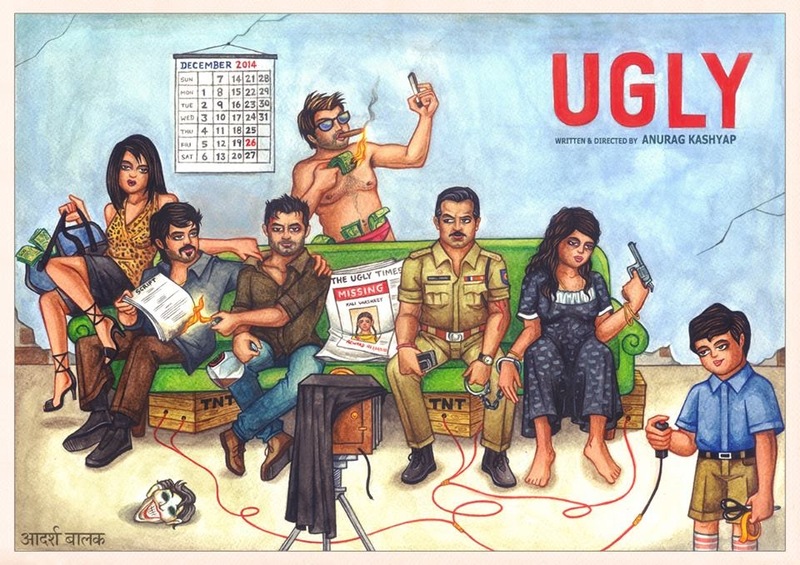 Tridevi's poster sees the cast of characters sat on a sofa beneath which boxes of TNT are loaded, with his Adarsh Balak boy in the foreground, ready to push the trigger. It's always interesting observing the evolution of art and styles- Tridevi's painted comic work, created to deliberately mimic the traditionally painted illustrated Adarsh Balak, is also perfectly in sync with the painted posters for Indian films that were commonplace from the 30's through to the 70's. It's a style that would perhaps today be seen as dated and stilted, and indeed, even 'ugly,' so it operates on a thematic level, too. Indian cinema's painted posters were a unique art form in themselves: bright and lurid but incredibly arresting and dynamic, painted by hand on vast canvases and hoardings around India, displayed on billboards, buildings, shops, and so forth. The practice saw a decline from the 70s onwards as cut-and-paste techniques along with photography and digitlisation became standard, effectively shutting down the small industry. 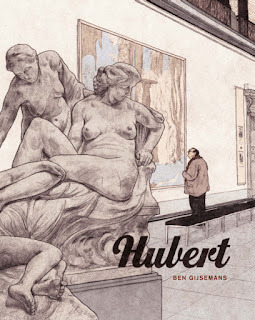 It's not uncommon for the value of an art to be recognised after its time, and whilst efforts are being made today to collate and preserve any posters and work found, most of it has sadly perished, the artists nameless. It's funny to see that sort of come full circle, partly due to the rise of nostalgia and 'vintage' as saleable concepts. Further evidence that nothing really goes out of fashion.